I am making these pumpkin spiced pecans, and I am so excited about it. I’ve had these pecans for a while, and then I saw this recipe and thought it would be the perfect addition to my family’s Christmas Eve tradition of grazing delicious food all day long, and complaining about how full and uncomfortable we are. Sounds fun, right!? Well, it is. Seriously. My brother is making a ham in his smoker. My mom is making cheesy scalloped potatoes. There will be shrimp cocktail, buffalo chicken dip, Christmas cookies, and wine. I hope everybody has a blessed and joyous day. 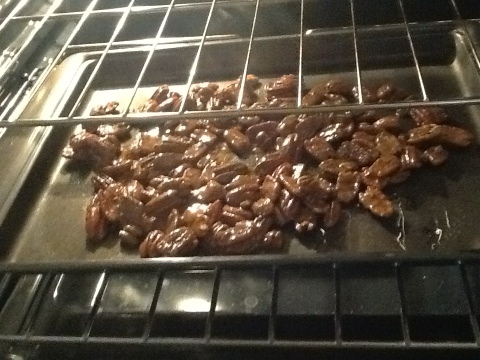 Here’s a picture of the pecans going in the oven. (I will let you know tomorrow how they tasted going down the hatch.